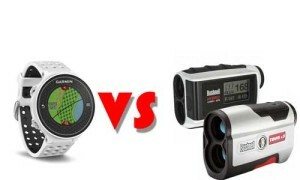 Golf GPS Devices and laser rangefinder serve the same purpose but use different technologies. 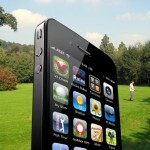 The technology behind each allows for slightly different benefits. The costs are essentially the same. 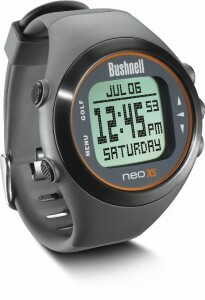 A GPS watch like the Skygolf Skycaddie Linx sells for $140 on Amazon and the Nikon Coolshot 20 is $180. GPS Devices give the yardage to the front, middle and back pin positions. Laser Rangefinders can the exact yardage (within a yard or two) as long as no obsticals obsruct the view. GPS Devices rely on maps that are loaded onto a server somewhere whereas rangefinders can give yardage from actual course conditions. This also allows you to use a laser rangefinder while out on the driving range or during practice sessions. Instead of guessing the yardage of your target on the range or trusting the course’s yardage markers, you can know within a yard or so the exact yardage using a laser rangefinder. This is one advantage for laser rangefinders over GPS watches or GPS golf apps. A GPS watch is fairly easy to use. All you need to do is load the course and the watch does the rest by advancing hole by hole. When you are at your ball, check the watch for the yardage. Operating a laser rangefinder is a bit more involved. It takes a bit of practice and precision to aim the rangefinder at your target and not mistakenly capture something in the foreground/background. 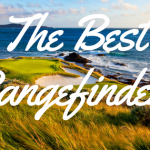 As long as your capture the correct target, a laser rangefinder will be more accurate than a gps watch for golf. Instead of relying on satellites and previously loaded front, middle and back pin locations you are dealing with actual course conditions at the time of play. Laser rangefinders also have the ability to calculate slope… if that’s your thing. As far as I am aware, no GPS devices on the market are able to accurately calculate slope into a suggested yardage. Click here for our list of the best GPS Golf Watches on the market.